I've been a strategic voter since the federal election in 1993, voting Liberal or NDP depending upon who had the best chance of defeating the Reform/Alliance/Conservative candidate. Since I started working for the province's Official Opposition, I have of course voted consistently for the Alberta Liberals - not merely out of loyalty to my employer, but because I admire and respect the three leaders I've served and their caucuses, and I support the policies they've developed over the years. But as the Wildrose Alliance surged during the current provincial election, I had a brief moment of weakness: was it time to return to strategic voting to stop a party even worse than the provincial PCs from forming government? 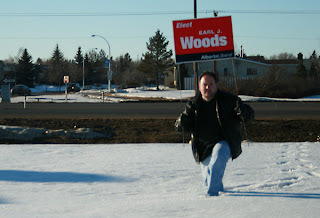 Living as I do in Edmonton-Meadowlark, Dr. Raj Sherman's constituency, there was never any question that I'd be voting anything but Liberal. But in conversations with progressive friends earlier this month, I admitted that I understood the reasons why they're considering holding their noses and voting PC. Indeed, my friend Stephen has crafted a very reasonable argument to that effect. It's an argument the panicking PCs are using themselves, pleading with progressives to vote PC in order to stave off the horrifying spectre of a Bible-beating, fiscally libertarian Wildrose administration. I believe that a Wildrose majority would be a bad outcome for Alberta. But is it really the worst possible outcome? Should progressive Albertans sacrifice their votes for the sake of a PC government that's intimidated health care professionals and municipal officials, consistently underfunded public education, mismanaged public health care into a state of ongoing crisis, solicited and accepted illegal political contributions and exposed teachers to being sued for discussing topics some parents are uncomfortable with? Can a Wildrose government really be worse than this? 1) Progressive Albertans will lose their already tiny representation in the Alberta Legislature. What a tragedy it would be to lose Laurie Blakeman, a powerful advocate for human rights and the environment. Or Raj Sherman, who risked his career and gave up the cushiest job in politics (PC backbencher) for the most thankless (Leader of the Official Opposition). Or David Swann, a man who has entered war zones to help the world's most vulnerable people. Or Rachel Notley, Kent Hehr, Brian Mason, among others who have spoken out consistently to expose PC corruption, defend vulnerable Albertans and uphold progressive values. Do we really want to sacrifice these people to keep the PCs in power? 2) We'll be sending a message to the PCs that they really can get away with anything, without consequences. Send threatening letters to municipal officials, bully doctors, pass regressive legislation, continue the slow privatization of health care - that's okay with us, because we're afraid that Danielle Smith might be even worse! 3) We'll demoralize ourselves, perhaps forever. If progressive voters give up now, how can we ever believe that one day we might elect a Liberal, NDP, or Alberta Party government - any government that's at least a little more in tune with our values? If we deny the many brave and excellent candidates running for progressive parties our support, how can we expect future progressives to step forward? Running for election is expensive and risky for progressives; I know this from personal experience, having run last time. Maybe the Liberal or ND or Alberta Party candidate in your riding is a long shot, but doesn't he or she deserve your support if he or she truly reflects your values? One day, a progressive party of one stripe or another will form government in Alberta. It probably won't be tomorrow, and perhaps not 2016 either. But that day will certainly never come if we vote against our own interests instead of supporting the policies and people we really believe in. Thanks Earl. Great post! Voting FOR the PCs is nothing but a vote FOR them. It will always be considered that way going forward by them. One thing is for certain, while propping up the PCs you are working against all of the wonderful, hard working progressive candidates out there who've put themselves forward asking for your support. It's not only keeping the WRP out, it's shutting out the progressive voices of the Liberals, NDP, EverGreens and Alberta Party out as well. Thanks Unknown! Very well said. I completely agree with your article. Strategic voting is lose-lose: you lose when the other candidate wins, and you lose when your strategic candidate wins. When you go to the polls choose who you feel will best represent you in the Legislature, you may not always win, but you can go about your day with a clear conscience that you fought to have your political values represented. Full disclosure: I am a Wildrose supporter, but for all his newness I like Raj and think with a little experience will make an excellent voice. Same for Mason, he's there to represent another part of Alberta that would be missed without his presence. Excellent advice Earl. I took out a PC membership to support Redford in the leadership race. I was extremely disappointed when she failed to deliver on her promises but then realized I'd been naive. She's a PC with PC values. A so called "strategic vote" for the PCs to protect us from the WR is simply a vote for the PCs and the denial of support for your own party thereby ensuring they'll never be elected. This is the opposite of "strategic", it's suicidal. Susan, I quite enjoyed your own piece on strategic voting - great stuff. And Anonymous, thanks very much for the Wildrose perspective! It is a 'rock and a hard place' for sure. Know that I feel your. I note your use the term 'progressive'. I have have long thought this synonym for the "left" was the proper one. "But is it really the worst possible outcome?" If one is a woman voter from the left (lefter than the NDP), then yes, it may be the worst possible outcome. I'm not in favour of strategic voting either, but I certainly don't want the WR to win. And while I wish that voting with my heart was enough, I have lived in a riding where all the progressives together couldn't take down the PC/Reform/Harper-Con candidate. Be very, very afraid. Excellent post, Earl! Thank you for articulating some things I hadn't quite gotten to in my own thoughts. Your riding sounds a lot like mine, where I volunteered and hoped and strove for Heather MacIntosh of the Green Party, only to find that Michelle Rempel, the Conservative candidate, took more votes than all 4 other parties. I think, however, that a lot of Canadians were either afraid of or scornful of Michael Ignatieff, and perhaps Jack Layton too, and these people looked at Harper as a known quantity, so they voted Conservative as a more sure option. More importantly, however, Canadians were sick of elections and wanted a majority government to call it done for four years. It saddens and disgusts me that Mr. Harper got away with blaming the other parties for this election when he orchestrated it by various means, including the release of a budget which he knew was bound to fail. And regardless of which MLA you vote for, do consider Elizabeth Johannson, running for the EverGreen Party, for the Senate race. The only woman out of 13 candidates, and all Albertans get to choose three candidates. I'd love to see her take the most votes! Watch Stephen Harper stew over that one, when it comes time to respect Albertan's choices while making his Senate appointments. A well-thought out post by Earl and many interesting responses. Kudos. Strategic voting as a tactic has gained a lot of power through social media. The trap is that because it's social, there is a certain amount of anonymity as to who is calling for a strategic vote and why. Without a clear picture as to why to cast a strategic vote, you essentially throw your vote away. You are making an investment without doing due diligence, no matter how you justify it to yourself. It's like picking a stock by throwing a dart at a newspaper. And speaking of newspapers (and Old Media), they love to report on strategic votes. You get a lot of editorials and reportage on this topic during the last week of any big election. Again, do voters see who is creating this media buzz? Or put another way, are Old Media outlets objective? Do the editorials present balanced political views? Are there no connections at all between a media outlet and a political party other than the interplay between a politician and a reporter? The answers to these questions turn out to be very complicated. Too complicated to trust completely, but plausible enough that people still buy into Old Media. And that's also how voting these days is: too complicated, but just barely plausible. The key as I see it is not so much how people will vote, but rather how many. There's a difference between the froth raised in New and Old Media and actual physical voter turnout. Finally, there is a solution: if you don't like to politics, move. That's exactly what my wife and I did, just out of U with no money and not a lot of prospects. Come to Beautiful British Columbia, where the electioneering runs pure and clean as a mountain brook. Just don't drink the political water, it's got a nasty case of christyclarkii crapsalloverus virus right now. In the meantime, good luck on your election. I hope folks do get out to vote! Unfortunately we can now see how it turned out. PC majority is perhaps better than WRP majority or possibly even minority. And now perhaps the PCs are emboldened but might move even more to the right to solidify their support. I don't understand this, Earl. What is so terrifying about Libertarians? Afraid that once they get into power they'll leave you alone? Also, is Left/Right even useful as a description of political and economic philosophy anymore? Trying to fit the dual dichotomies of social authoritarianism/libertarianism and state control of the economy/individual control of the economy onto a single axis of left/right is like a compass with only East and West marked down - it's like describing North as somewhere on an East/West line. Thanks for your perspective. I'm totally on board with social libertarianism, but I don't think it works economically. The problem with "leaving people alone" is that we live in an imperfect world. A libertarian utopia sounds nice, but it would be pretty hard on the less fortunate; likewise, I don't believe market forces are sufficient to prevent the rise of robber barons, child labour, environmental devastation and so on. As a social democrat, I believe that society works best when people work together; I'm not a fan of the dog-eat-dog world that pure Ayn Rand style libertarianism would produce. That's where I'm coming from, but of course your mileage may vary! Yes, the difference between 'left alone' and 'left behind' is the critical one. Liberty is great, but libertarianism as an ideal can be off-putting when you consider how much selfish and immature behavior total freedom can generate.